Would you like to grow an eggplant tree, yes you heard right, a tree, that can produce dozens of eggplants, and not die down in winter? Well, you can if you graft eggplants (or tomatoes) onto a perennial Devil Plant rootstock. In this article (which is probably one of the most comprehensive articles on the internet on the subject of grafting devil plants) we’ll explain how this is done. Devil plants are used as a rootstock to graft onto because the plants are very vigorous, with a stronger root system, allowing the plant to support more fruit and tolerate diseases that affect the root system of eggplants and tomatoes. In a warm climate or in a greenhouse (or appropriate cover) in colder climates, the plants will produce eggplants year after year. They say the devil is in the details, and with devil plants, there are some details we need to consider – namely what exactly is a devil plant? When people refer to “devil plants” for eggplant grafting, they may be referring (or indeed using) any of the “devil plants” in this family – Devil’s apple (Solanum capsicoides), Devil’s fig (Solanum torvum) or Giant devil’s fig (Solanum chrysotrichum). All devil plants are members of the Solanaceae (nightshade) family of plants, which also includes tomato, potato, eggplant, chilli peppers, capsicum, tobacco, petunias and many others. That’s why you can graft eggplants and tomatoes onto them, because they’re related. The Devil Plant (Solanum capsicoides) is a native of South America and grows as a perennial bush or small tree up to 3m high. the botanical name Solanum aculeatissimum is used to describe Solanum capsicoides, which also goes under the names of Cockroach berry, Indian Love Apple, Soda Apple, Devils Apple and Devil Plant. Devil’s fig (Solanum torvum), commonly known as turkey berry, prickly nightshade, or wild eggplant is a erect perennial shrub, 0.8–2.5 m high, native to the West Indies, which has spread to many countries with tropical climates. it is a short-lived perennial, it is reported that .most plants live about 2 years. The fruit are used in Thai, Jamaican Lao and Indian cuisine. There can be disagreement regarding the identification and botanical classification of devil plants. The Giant Devil Fig Solanum chrysotrichum has been previously wrongly classified as Solanum hispidum. It’s a shrub or small tree to 4 m which is native to tropical Central America. All of these devil plants have been used around the world to graft eggplants and tomatoes onto, so use these varieties, they are tried and tested. Do not select random wild solanum family plants to graft onto! How sound is this technique? Doing some research, I found an article published by the Queensland State Government, Department of Agriculture, Fisheries and Forestry – “Grafting eggfruit to control bacterial wilt”, in which they recommended grafting eggplants on to a resistant devil plant rootstocks to avoid the problem of bacterial wilt which is a major disease of eggplants. A rootstock that can be used in eggfruit grafting is devil’s fig (Solanum torvum), the fruit of which is used in Indonesian and Thai cooking. 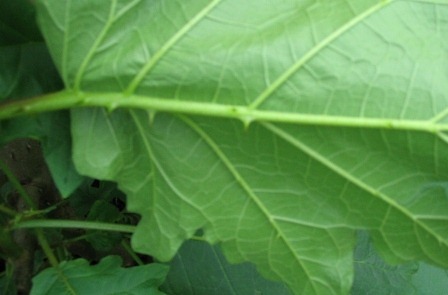 Devil’s fig is quite resistant to bacterial wilt (Ralstonia solanacearum); however, it has shown wilt symptoms when planted through plastic mulch, due to the higher soil temperature under the plastic. They are a State Government, Department of Agriculture and they’re suggesting to farmers that Devil’s fig (Solanum torvum), Giant devil’s fig (Solanum chrysotrichum) and wild tobacco tree (Solanum mauritianum) are suitable as rootstocks for grating eggplants onto. So there you go! How do you distinguish a devil fig from a giant devil fig? Here is an extract from a government source which explains the difference. Devil’s fig (Solanum torvum) is very similar to giant devil’s fig (Solanum chrysotrichum). These two species can be distinguished by the following differences: devil’s fig (Solanum torvum) has moderately large leaves (usually 5-21 cm long) with several (about seven) slight to moderately deep lobes. Its relatively small white flowers (up to 25 mm across) have small sepals (3-4 mm long). The dense star-shaped (i.e. stellate) hairs on its new growth are whitish or yellowish in colour. Giant devil’s fig (Solanum chrysotrichum) has moderately large to very large leaves (usually 9-35 cm long) with several to numerous (seven to thirteen) moderately deep to very deep lobes. Its relatively large white flowers (30-40 mm across) have relatively large sepals (7-10 mm long). The dense star-shaped (i.e. stellate) hairs on its new growth are reddish in colour. Put simply, the easiest way to tell them apart is that Solanum torvum has white or yellow hairs on the new growth, while Solanum chrysotrichum, whose species name “chrysotrichum” is ancient Greek for “gold hair”, which is rather misleading, actually has reddish coloured hair on new growth. If you can’t get find a devil plant, there are a few other Solanaceae family of plants you can use instead. For those who would prefer to use a native plant rather than an exotic, Solanum aviculare, commonly called kangaroo apple in Australia, poroporo or New Zealand nightshade in New Zealand , is a relatively short-lived perennial shrubs, with a life expectancy of 5-6 years in good conditions. It is native to New Zealand and the east coast of Australia. It will work well as a rootstock for grafting eggplants, and you shouldn’t have any trouble finding this in Australia or NZ, as it’s a native plant. It’s own fruit are edible, but only when they’re completely ripe, their poisonous when unripe. Solanum mauritianum, commonly known as wild tobacco, tobacco bush, tobacco weed, kerosene plant, ear leaf nightshade, woolly nightshade, flannel weed and bugweed, can be used to graft eggplant or tomato onto. This is a small tree or shrub native to South America, including Northern Argentina, Southern Brazil, Paraguay and Uruguay. It has spread to Australia, Azores Islands, Cook Islands, Fiji, Hawaii, India, Madagascar, Mauritius, New Caledonia, New Zealand, Norfolk Island, Réunion Island, Solomon Islands, Sri Lanka, Tonga, and several southern African countries, so if you live in any of these locations you may be able to find it growing wild. Spines on leaves too – that’s why it’s a “Devil plant”! Our interest in the Devil plant is to use it as a rootstock to graft eggplants (Solanum melongena) on to. This is a popular practice with Europeans, including the ones living in Australia. pepper are grafted onto Capsicum annuum (pepper). For home gardeners, grafting creates an “eggplant tree” which can literally produce from dozens to hundreds of eggplants according to many accounts I have heard. The only necessity is to cover the grafted tree in winter in cooler climates so the eggplant grafts don’t die off. 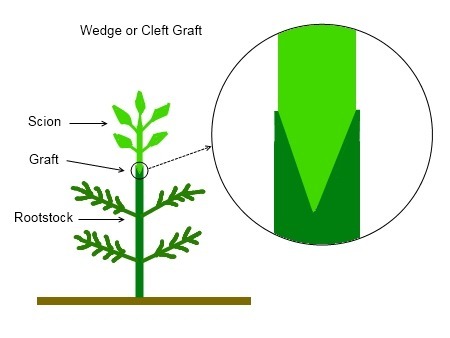 The grafting process is relatively simple, you just use basic cleft “V” grafts, and the bits you cut off the Devil plant can be used for striking cuttings to grow new Devil plant, and you can either root the cuttings in water, or in potting mix. Now that we’re familiar with the plant, lets get grafting! Before I go into describing the process of grafting eggplant onto the Devil plant, it’s probably a good idea to quickly cover some basic horticultural concepts. Grafting is the practice of joining the living tissue from one plant to that of another plant that is either the same species or closely related, so that they will fuse together to form a single plant. There are many grafting techniques, and here we will learn how to perform a Wedge or Cleft graft, sometimes referred to as a “V” graft. It’s one of the simplest grafts, it has a very high success rate and can be done with very basic tools. In grafting, the plant that you are grafting onto that has roots is called the rootstock. The scion is prepared by making two sloping cuts at its base to form a wedge 2.5 to 3 cm long (depending on how thick it is). The rootstock is pruned at the desired height (if grafting to top) or its branch is pruned part way (if grafting to branch) and a clean edged cut is made down the centre of the stem for about 3 cm. The scion wedge is inserted into the rootstock, with one or both edges lining up perfectly to match the cambium layers* (If the scion wedge has a thicker side, match the edge on this side). The union is tied firmly with grafting tape to seal the union, and to prevent moisture loss, and to stop scion movement. * The cambium is the thin green layer of tissue located just beneath the bark, between the bark and the wood, and is a layer of actively growing cells which produce the wood, bark and vascular tissue of the plant. In making a graft the object is to place the cambium of the scion in close and firm contact with the cambium of the rootstock by accurately lining up the outer surface, then binding it carefully so it doesn’t move. 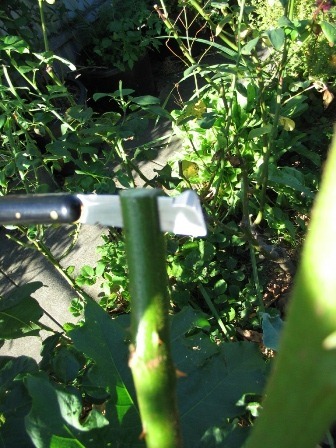 The cuts to scion and rootstock must be made with a very sharp, clean blade to obtain a flat, clean surface and minimise damage to the tissues. Now, you won’t need all these things to perform a graft, as some are optional, but you will need most of them. 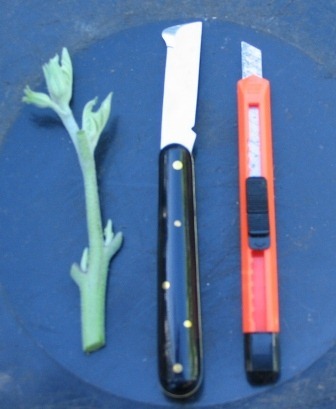 Select your eggplant for grafting, and using secateurs cut a tip or branch about 5-10cm long to use as a scion. Cut away all the large leaves from the scion, leaving only small leaves and buds. This prevents moisture loss and increases the chances of the graft surviving. Now you’ll need the grafting tools for cutting the wedge shaped end of the scion. 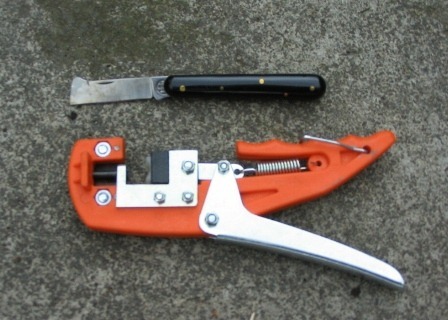 Pictured below is a grafting knife and an automatic grafting tool. Any sharp, clean knife will do the job, and a small cheap craft knife (the “Stanley knife” style with snap off blades) shown on the right works very well. The scion is prepared by making two sloping cuts at its base towards the end to form a wedge 2.5 to 3 cm long. Completed scion with “V” or wedge shaped end. In case you’re wondering why use a dedicated grafting tool, well, I’ll tell you. It makes precise, exact matched cuts that fit together perfectly, that’s why! And furthermore, if the grafting tool has a “keyhole” or “omega” blade, then the scion and rootstock can be cut to “key” together like a jigsaw puzzle piece, as shown on the scion below. Using secateurs, cut the branch you wish to graft to at the desired length, remove the spines where you intend to graft (to prevent injury to your fingers!) if you like, and remove any leaves from the branch. Using a grafting knife, make a split or “cleft” through the center of the stock and down 2.5 to 3 cm to match the wedge on the scion. Insert the scion into the split or cleft in the end of the rootstock branch. The cambium of the scion should contact the cambium of the rootstock. If the rootstock is thicker than the scion, then just line up one side. If you find that the rootstock is too hard or woody to open up, you can cut a very thin wedge out of the end of the rootstock that is smaller than the wedge on the scion, then use the knife to pry it open while you push the scion into it. Secure the graft tightly with grafting tape to prevent moisture loss and to stop the graft from drying out. 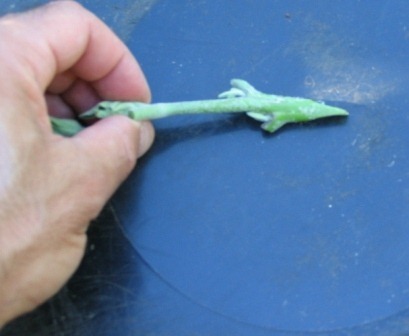 Make sure that the grafting tape is wrapped tightly around the graft join, and extends over part of the rootstock and scion to make an airtight seal. 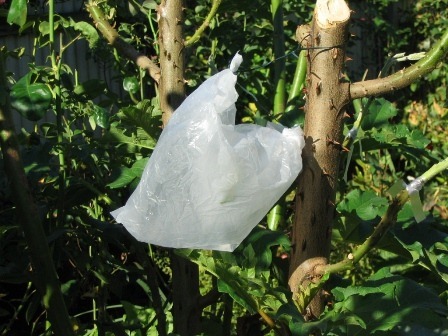 If you don’t have grafting tape, you can cut strips from a sturdy plastic bag, which is what I have used here. I get the same success rathe as I do with proper grafting tape. The strips need to be about 50 cm long, and I cut them about 1.5 cm wide. Remember that a bag is doubled, so when you cut across a 25 wide bag, you get a “loop” which is 50cm long when you make a cut in it. 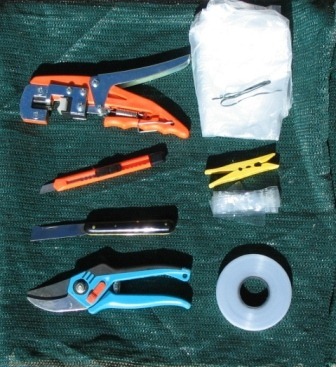 The success rate of grafting will be greatly enhanced if the newly completed graft is covered with a small plastic bag and tied on the bottom with a wire tie to allow both a build up of heat and humidity. I add a few drops of water in the bottom to increase humidity, and get a bit of air inside the bag before tying it off, so the bag isn’t hanging off the scion. I’ve also found that tying one corner of the bag to a higher branch lifts it up so it is not draped over the graft. If the plant is in a shaded greenhouse, then it will be fine, but if it is exposed to the sun, then the graft will need some shading otherwise the scion will get steamed and cooked in the plastic bag. Some prefer to place a small brown paper bag over the plastic bag to prevent excessive heat build up, but my preference is to use a small piece of shadecloth to let some light in. Just simply fold a piece of shadecloth around the bag, and fasten it with a clothes peg. If you have multiple grafts, you can place one larger piece of shadecloth over all of them at once. With a eggplant graft to a Devil plant, I have found that I can remove the plastic bag after one week. 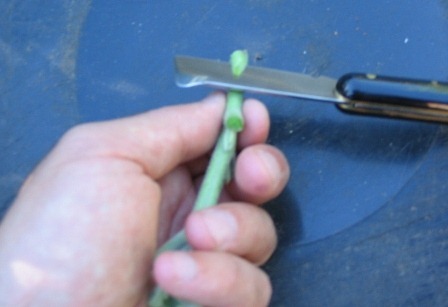 The grafting tape can be left on until the grafts show some decent growth, which can be over a period of a few weeks. If left on too long (months) the tape may restrict growth by becoming too tight n the graft area. In a few weeks the grafts will flower and fruit, prolifically! All the grafting pictured was carried out mid-summer, because that’s when my eggplant seedlings were large enough to take cuttings from. I have carried out about a dozen eggplant grafts on the one Devil plant, and they have all taken successfully. Tomato can also be grafted on to the Devil plant, and you can have both eggplants and tomatoes grafted onto the same tree too. There’s nothing like experimenting to see what works. I’ve even added two cherry tomato grafts, and they worked out too. 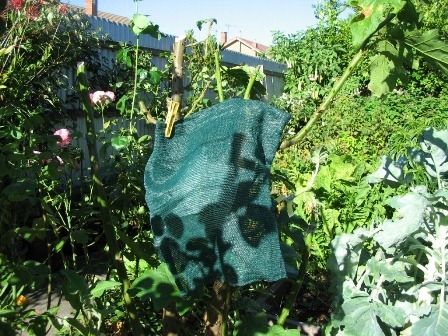 I’ll need to figure out how to cover the plant for winter, and what to use to protect the grafts from the cold. I have updated the content on this article and in response to previous comments, have added this section. To those thinking about posting about the ‘weed’ potential of the devil fig, please note THIS IS AN INTERNATIONAL WEBSITE (with the majority of readers outside Australia! ), please be mindful that what plants may be indigenous or native to your area may be a ‘weed’ elsewhere, it works both ways. For some readers this is a discussion of their native plants, plants that form part of their native cuisine or traditional medicine. Grafting eggplants onto devil plants is a commercial agricultural practice in China, and a common practice amongst European gardeners, as well as ethnic gardeners of Southern European origin who live in Australia. Learn to respect other people’s cultures! Your native plants are someone else’s ‘weeds’ too! A ‘weed’ is not a scientific or biological category or class of plant, it’s a value judgement statement based on human preference – it’s a plant growing where the observer doesn’t like it growing. If we were to write ‘weed warnings’ based on every geographical location’s perspective, EVERY PLANT WOULD HAVE A WEED WARNING! As responsible gardeners, and mature adults able to make informed and responsible decisions, it is common sense that if plants have the potential to escape from your garden, IT IS YOUR RESPONSIBILITY to contain them, and comply with any legalities of your area! Secondly, if you’re grafting these solanum rootstocks, all branches SHOULD BE GRAFTED! There shouldn’t be branches producing the rootstock flowers and fruit, you don’t want the plant’s energy going into something you don’t eat, they should be producing eggplants. It’s OK to have some rootstock leaves on the lower branches though. Very informative, great article Angelo! I was in Sicily in October and a friend of mine who has a summer home there on the beach had two soda apple plants onto which he had grafted several eggplant scions. They were growing well and even had several small eggplants on them. I was intrigued and wanted to try this in Virginia. The problem is finding devil plant seeds or plants to use for root stock. Any ideas on where I can get them? 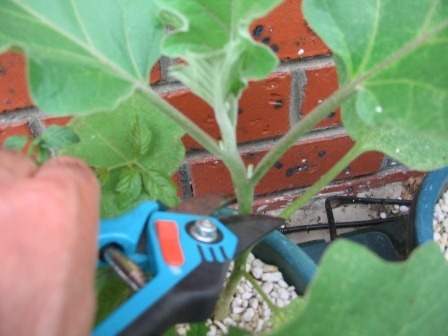 The wedge graft is very reliable for grafting eggplants onto Solanum capsicoides. I have recently been shown another successful grafting technique for grafting scions to the sides of branches rather than on the ends. The scion is cut at an angle from one side only, and a T-shaped cut is made on the bark of the rootstock (just like in a bud graft), and the bark is lifted and the scion inserted and taped up with grafting tape. From the descriptions I’ve seen of Solanum torvum (Turkey Berry), it sounds very similar to Solanum Capsicoides (Cockroach Berry) in size and structure (along with the thorns too! ), it’s obviously from the same Solanaceae family, and it’s used for grafting eggplants onto, so I’d think they are pretty similar. Incidentally, Wild tobacco (Solanum mauritianum) is another popular Solanum rootsock used for grafting eggplants, so I would guess that as a rootstock for grafting eggplants there is no real diffrence. As to which eggplant variety to use, I’ve seen a wide range used as the scion. I’m using “Black Beauty”, a friend of mine has five different varieties, including “Midnight Mini Lebanese”. It appears that most work well, including the standard shop-bought seedling varieties. The only negative report I have is from a friend who grafted one of the exotic lavender and white coloured eggplants (don’t know the name of the variety, neither did they) and it produced lots of growth but would not flower. If anyone wishes to let us know which varieties work best for them and what their location is (as in State or City), that would be much appreciated. Now that it is April 2010, is it too late to onto Cockroach Berry. Eggplants are still in growing condition, Tomatoes a bit dicey, Capsicums are still growing strongly. I also grafted eggplant onto Kangaroo Apple. 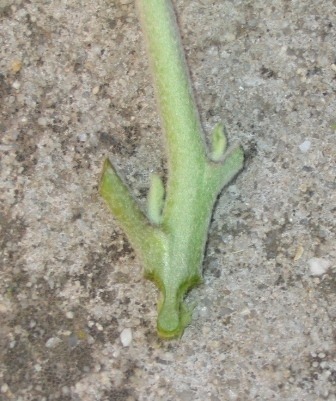 The wedge graft is doing ok, the chip bud is growing very slowly. In a small glasshouse I have a capsicum (grown from Greengrocers saved seed), it is still producing and is 4 years old. Will it last much longer. I was a horticulturist for many years. I can no longer perform that work due to age and disabilities. I depend greatly on growing and raising our own food. Because of our hot and humid climate, soil borne diseases proloiferate here. I thought losing everything to 12 feet of flood water from hurricane Katrina was the worst thing that could’ve happened to me and my family. Well, my garden failures are every bit as devastating as that terrible storm. The garden failures don’t stop, they just keep coming! Do you have any idea where I might be able to procure some seeds for this Devil plant. I sure could use the protection they provide! Thanks in advance!!! If you know of seed availability for any of the acceptable root-stock plants, I would be interested in receiving some. I might be able to offer other seeds in exchange or purchase them. My email is thefairfaxgardencorner@gmail.com. I believe it might be a bit late to graft eggplants onto a Cockroach Berry/Devil plant at this time (April/Autumn) as the graft won’t have much time to grow, and may fail because the cooler weather may kill of the scions. If the graft survives the winter temperatures, then it won’t be a wasted effort. Really, there’s no harm in trying, if the graft fails, you can start some eggplant seedlings really early in your greenhouse, and graft them in spring onto the same locations. I’ll let everyone know that you can definitely use Kangaroo Apples, which are also part of the Solanaceae (nightshade) family, to graft eggplants onto. Just remember that the Kangaroo Apple is a short-lived perennial, with a lifespan of 5-6 years. After that your rootstock dies off and you have to start over with a new plant to graft onto. Capsicums, and most of the chilli family, are perennial plants in their tropical places of origin. A greenhouse can keep the temperatures elevated enough to replicate the plants native climate, preventing them from dying off in winter. I don’t own a greenhouse, so I can talk from experience here, but I’ve heard reports of them potentially lasting 7 or more years. I’m trying some Bhut Jolokia Chilli plants (world’s hottest chillis) in a friend’s greenhouse over winter, I’ll be happy if they survive so I can plant them out next year. Do you know of a source of Cockroach Berry or Turkey Berry seeds to use as rootstock for tube grafting. Don’t know of any commercial sources of Cockroach Berry seeds, it’s one of those plants that are distributed amongst keen gardeners via cuttings. Perhaps I should have let mine seed before I grafted onto all the available branches! I propagate the devil plant from cuttings, which is exactly how the people that gave me the plant propagated it, and so on. It does seed., I’ve just cut off the flowering branches to graft onto. This year I’ll allow some of the flowers to set seed and I’ll aim to make them available to people who would like some. Thanks for the suggestion. Ha did you propagate the devil plant. Was it as simple as take a cutting and still in some potting medium. I was really intrigued and fascinated by grafting eggplant onto devil plants. The question that I have is, is devil plant and wild tobacco plant the same thing. Because I believe you can graft eggplant onto wild tobacco plants. I would appreciate it if you could let me know. The Devil Plant (Solanum capsicoides) and Wild Tobacco (Solanum mauritianum) are totally different species, but both are of the same genus or family, the Solanaceae (nightshade) family of plants. You can graft eggplants onto Wild Tobacco in exactly the same way. In fact, I will be grafting eggplants onto both Wild Tobacco and Devil Plants at a community permaculture greenhouse where I do voluntary work in the next month or so. Had great yields of eggplant Supreme from Capsicoides rootstock last year – until stormy weather began breaking the plants up at the graft union. Partly my fault as we let too much fruit develop and the weight was a strain – this year will harvest fruit when immature. Thanks for the detailed guidance on how to graft eggplant on to the Devil Plant. Thanks also for noting that in addition to eggl[plant we can also graft tomato and capsicum. To protect the graft in winter, it seems to me that a sheet of thick clear plastic stiched on two sides to use it as a cylinder with stakes around the Devil Plant would help. For grafting, I choose a vigorous branch and splice the bark with cambium with care to avoid cutting the wood of the stock plant. Slice the graft on one side to expose the cambium and place it under the cambium of the stock and tie it with grafting tape. I leave the rest of the branch intact until the graft takes. One it has taken, I cut off the branch of the stock above the graft. To avoid moving the graft, I merely fine spray with cold water twice a day for two weeks. By then the graft normally has taken. I believe that you may be dealing with Solanum Aculeatissimum instead of Solanum Capsicoides, at least I think so as my plants really don’t look anything like yours. My leaves have much less intense lobing, a dusting of fine hairs and a small amount of tiny thorns. Yours look like a landscape manager’s nightmare. S. Capsicoides was once included in S.Aculeatissimum as variety denudatum which has led to sharing of the common name and many instances of one being misidentified as the other. From your photos, I think you are probably better off as my grafts have good disease resistance but nowhere near as vigorous growth. Hi, Will, thanks for this information, this is really helpful. You’re right, the names devil plant and cockroach berry are used for both Solanum Aculeatissimum and Solanum Capsicoides. Apparently there is some controversy amongst taxonomists over this one! Looking up some of the horticultural databases (see link) I found that “…”In Asia Solanum aculeatissimum is used as rootstock for tomato and eggplant….” I can understand the rationale of using this plant as a rootstock, it is a vigorous plant that grows over 2m tall, wheras Solanum Capsicoides is a smaller, less vigorous shrub. It looks like Solanum aculeatissimum is indeed the plant I’m using here, although Solanum Capsicoides will work well too, but will give you more of an “eggplant bush” than an “eggplant tree”. Great article on this type of grafting, thank you. You can also translate this website with Google Translate or using Google Chrome. I can’t find seeds or cuttings of your Solanum rootstock for eggplant, could I buy you some seeds, cuttings, or can you tell me where to find it ? There’s been quite a bit of speculation over the identity of the plant in this article. Another visitor to this site, Will, in his previous comments, suggested that the plant pictured is Solanum Aculeatissimum. I checked this against Solanum torvum, which appears to be popular in Italy, and one of the differences is the fruit. This one definitely isn’t Solanum torvum, the fruit look different. Incidentally, while researching the two plants, I found out that Solanum torvum has edible fruit, and from what I’ve read, the fruit of both Solanum Aculeatissimum and Solanum Capsicoides cannot be eaten, thay are in fact quite toxic! I must say that your site is fantastic! You have many usefull informations, very well organized! I am so curious about this egg-plant tree! I can’t wait to see your pictures! Thank you for your work, and for your help! I obtained some seed of Solanum Mauritianum (Wild Tobacco) They grew readily, but I am a bit reluctant to graft edible solanum onto them after reading p 60, Action Alert, Organic Gardener, Nov/Dec 2010 which points out that ALL parts of the plant are toxic to humans. What do you think? 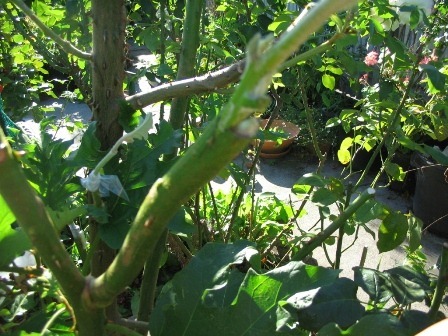 The Eggplant – Lebonese Bunching- is going very nicely grafted onto Kangaroo Apple. I got some seed which I believe to be Solanum Torvum. I intend to plant and graft on other solanum. Yes, many of the Solanaceae (Nightshade) family are toxic, even tomatoes and potatoes. It’s only certain parts of these plants that are edible. Tomato leaves and green potatoes contain the plant alkaloid solanine, which is both a pesticide and fungicide, and serves as part of the plant’s natural defences from being eaten. 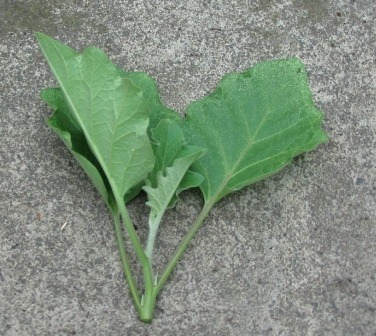 Eggplant leaves contain the very same substance. The plants we are grafting onto are close enough relatives of the eggplant that we can graft onto them without any concerns, as the substances within the plant are not taken up into the fruit. Caution is warranted though, as you can’t just graft onto just any of the Solanacea family without a bit of common sense, best to stick to the varieties recommended in gardening circles as these are tried and trusted. I read a case of a couple in Japan grafting eggplant onto a Datura (Devil’s Trumpet), heaven knows why, as these plants have the same alkaloids in them as deadly nightshade (a different class of alkaloids, the tropane alkaloids)… The grafts did indeed take, but when they ate the eggplants they ended up in hospital with tropane alkaloid poisoning. A bit of common sense goes a long way! Here in NZ tobacco weed (Solanum mauritianum) is a major pest. It’s allelopathic too, so it can inhibit the growth of nearby plants. I’ve been removing it from Waiheke Island. The first time I handled one I wasn’t wearing gloves or a face mask. Within seconds I was wheezing, coughing, sneezing – it’s awful stuff to handle. Nausea is another side effect. Avoid if possible! Thanks for the warning about Solanum mauritianum, this wouldn’t be the first choice for a grafting rootstock for the reasons you mention. Thankfully Devil Plant (Solanum capsicoides) has no such isssues, the only thing you have to be careful of is the thorns, hence why I recommend this species, and why it’s used around the world for grafting eggplants! Some friends who also have grafted eggplants managed to get their grafts in earlier because they had access to eggplant seedlings very early (by buying them in an advanced stage ridiculously early in the season – commercial growers produce them in heated greenhouses and sell them to the public), I’ll check to see how their plants went this year. Since I grow my eggplants from seed, then graft them, even starting them indoors didn’t work because we had a shaky start to spring, and the summer has progressively getting shorter here in Melbourne due to climate change over the past few decades, so it’s starting to look like we simply don’y have a long enough summer to do this type of thing without greenhouses! I was not able to find this seeds until now. How to get the seeds of Solanum capsicoides (Devil Plant) . I am staying in Kerala State, India. I tried grafting the egg plant in Solanum torvum( this plant is common in my place). 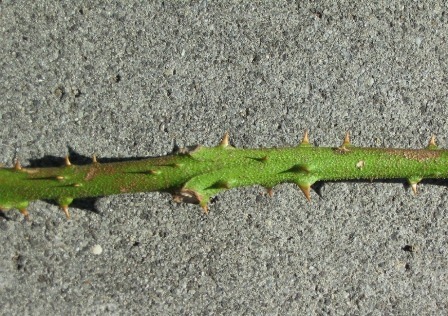 It is growing for two or three months after that the Graft joint becomes yellow and whole plant is perishing by itself. I don’t know the reason for that.. Now I decided to try in Solanum capsicoides (Devil Plant). Please help me by sending some seeds of it. The plant in the picture is Solanum chrysotrichum. I’m completely amazed and humbled by this article! It seems like heaven growing on a devils’ tree to a nightshade lover like me. I would also love to be on your seed list if you have one! I’m so inspired by this idea!!! I’m one of those people who love the Solanaceae family of plants too! Luckily, O’ve managed to get a new shoot growing from where my devil plant was removed, I’ll grow it to size again and try to gather some seeds for everyone who has asked! Someone from around the world might be able to! I saw this today in Mt Lawley, Perth, Western Australia. It is in an old Mediterranean food forest garden . The photo quality is not great as it was over the fence with an Iphone. It looks like it is surviving really well. I’m the founder/moderator for Punk Domestics (www.punkdomestics.com), a community site for those of use obsessed with, er, interested in DIY food. It’s sort of like Tastespotting, but specific to the niche. I’d love for you to submit this to the site under Microfarming. Good stuff! If you have seed to spare I would be very inerested! Hi Jess, thanks for the great feedback! A ‘wild tobacco plant’ (Solanum mauritianum) can be used to graft eggplant or tomato onto. Do a search for the botanical name Solanum mauritianum to identify it correctly. Purple flowers with yellow centres, and leaves that smell like diesel when crushed. hi, love the idea of grafting eggplant to a solanum rootstock of any discription just need to find the seed anywhere you can find them or buy them in melbourne? I must clarify, please don’t use “any solanum rootstock of any description” – only specific ones, such as the ones listed in the article! Most solanum species are unsuitable as rootstock, and many solanum species are toxic! Please, only use the ones everybody else is using, they’re tried and tested… and safe. The suitable eggplant rootstock are normally freely sharesd amongst gardeners, you might find some if you ask around. Mine was inadvertently uprooted by a well-meaning family member when I was waiting for it to seed. I managed to rescue a tiny plant that popped up near where the parent plant was, and I’m trying to grow it to size once again. I live in mission beach. We have more devil’s fig than you can poke a stick at… if you live in Melbourne and want some seed – try to find a friend up this way (anywhere from Tully to Cape Tribulation)- they are a weed – especially in the disturbed forest after cyclone Yasi !!! I have successfully grafted eggplants (long purple, the purple and white variety you talked about, a large green variety and a large white variety) on several occassions using a variation of a toungue and whip graft shown to me buy a local chinese fellow. Up here in the tropics, the only way to grow eggplants (or any of the solonacea family) is buy grafting as they are very succeptable to either the bacterial wilt or nematode infection which preceeds the wilt. I had 5 plants for about 4 1/2 years producing quite prolifically, though when the neighbour sprayed paraquat along the fencline and killed 4 of them off, I was not happy! the other i transferred to a mates place when i moved and it is still producing – though not a lot it has been over 7 years now! The success rate for myself is not great – prolly about 20% of all attempts. But by far the most important part of the process is POST graft care. The more you care for them the more successful….. I get some fencing tie wire and make a loop around about 15cm in diameter. I then tie a thicker piece of wire at right angles to the loop so it might look something like an angel’s halo in a fancy dress getup. 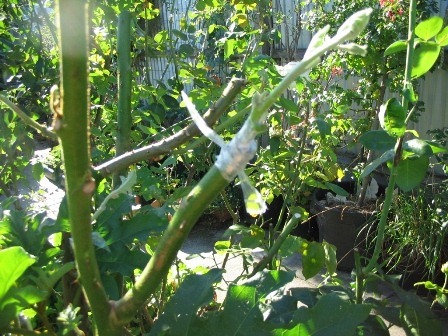 I then put the loop over the graft and either stick the thicker peice of wire into the ground (or tie it to the stem of the devil’s fig below the graft). I then drape a freezer bag over the loop and tie it off. The whole pot (i don’t graft in situ but grow in pots for grafting and plant out once they take) is put into full shade for about 3 days, then i put the pot in the dappled shade of the rainforest for another week. After that they are usually good to go if they are going to work. Thanks Darrin, great advice, glad you could share your experience! Much appreciated. A great article- most informative and interesting! Would love a few seeds of your Solanum Aculeatissimum if possible. I am concerned about using the right rootstock because of the toxicity of some species. Is the S. Aculeatissimum resistant to nematodes and the soil-borne microfungi that infect eggplant? Thanks, I’m trying to grow one for seed, it’s taking a while as it’s a small plant. I would think that this rootstock species is resistant to pathogens that affect eggplant because this is bot a cultivated species, but a wild plant that is very hardy, what I would call “bulletproof” and doesn’t seem to be affected by much at all. Eggplants in very susceptible to variety of diseases and some pests. and they are ggrafted onto these wild rootstock which have higher resistance to disease, pests and climatic conditions. This rootstock species is documented as being resistanct to Verticillium wilt. Just by chance I found this great site. For the past four years I have been looking for that misterious solanum capsicoides or devil’s apple plant. I live in Sydney SouthWest and if anyone has this plant I realy would like to have, seeds or cuttings please. Solanum chrysotrichum grows wild up here in subtropical Northern New South Wales along the roadsides and in waste areas – it is also known as the Giant Devils Fig. I am happy to collect and send seed to anyone who wants to give grafting a try, although as you can appreciate the seed is only produced at certain times of the year. This plant can attain a height of about fifteen feet and as much across, it would look great as a multi graft as it has many semi-woody branches. Hi Phil, can we get seeds this year or we need to wait until next year? I’ll check to see if the plants are currently in fruit, they were flowering last time I looked. Checked some wild plants today, no sign of fruits or flowers although they were only youngish. I know of some older trees near Nimbin, will try and pick some fruit next time I drive across that way. Fantastic and intriguing idea. How much did you harvest at the end of this ‘tree’? Also, how did you go about designing a guild around this ‘tree’? Always assuming you did design a guild off course. I will definitely try this as soon as I can find some suitable rootstock. Just wondering if there are more ideas like this, peppers and tomatoes have been mentioned. The normal fruit-trees as well. Would there be other vegetables that can be ‘treed’/perennialized this way? Long story, but I found that in Melbourne, Australia, our summers are getting progressively shorter and shorter, giving us a very short growing season. As I do a lot of seed saving, I grow my eggplants from seed, but the problem with that is by the time the seedlings had grown to a size that I could graft with, it was in the middle of an extreme summer heat, causing some grafts to dry out, and for the ones that survived, there wasn’t enough summer left to grow, flower and fruit from the grafts. Many friends of mine just use advanced eggplants which they buy from a garden nursery very early in the season, and graft with those, giving them tens of kilos of eggplants. Often, the grafts do not survive winter and need to be regrafted. It’s much easier with a greenhouse to grow your own seedlings early for grafting. As I mentioned in a previous comment, my tree was inadvertently uprooted by a well-meaning family member and disposed of when I was waiting for it to seed. It’s been replaced by a mango tree! I managed to rescue a tiny plant that popped up near where the parent plant was, and I’m growing it in a pot for now. Being a forest garden, there are always guilds around the trees. In this case, since there were a lot of low branches, I could only use ground covers and hebaceous plants around it, and some climbers on a trellis behind it. The climbers were snow peas in the cold season, which were suceeded by climbing beans and scarlet runnier beans in the warm season. Some perennial herbs provided a home for beneficial insects, and some daisy like plants were included to provide a food source for them. Since the devil plant has an extensive root system, I avoided planting anything that I would need to dig up to avoid root disturbance. I underplanted with clover as a nitrogen fixer on the sunny side, and in the areas that were shaded out I piled heaps of materials as a mulch which would break down as a form of “sheet composting” to feed the growth of the tree. I’m not aware of any other annual vegetables that can be grafted in this way. You can get perennial chilli trees, which naturally grow into a small tree around 2.5m (8′) high though. Interesting, especially the amount of produce coming from one tree! I will try to find some seed and ‘copy’ your guild just to see how it all works. The chilli tree is (Rocoto chili) is known as a rootstock so that might be an idea for grafting. Also the Malabar gourd is apparently used as a rootstock for cucumbers, and supposedly one can use it for any Curcurbit. Not sure if this would result in ‘perennial’ cucumbers though. It would be an interesting idea to use these ideas to make a ‘family tree’ – always assuming the graft would survive winter. This way, theoretically a collection can be kept alive without reseeding and in a small space (for those that would like to collect). Great read . Thanks for the grafting notes. After reading all the comments I am pretty sure that my eggplant was grafted onto the Solanum Acculeatissimum (I bought it from a stall holder at the Torrens Island Market out side Port Adelaide about 3 month ago). I noticed thorns on the stem of new growth then to my horror I noticed the leaves had thorns along the the main veins. I cut out the bolt down to the graft after I reseached the internet and found information that some devil plant are not suitable. Is there any where that can tests toxitity in the fruit to be sure? It appears that Solanum aculeatissimum is used to describe Solanum capsicoides, which also goes under the names of Cockroach berry, Indian Love Apple, Soda Apple, Devils Apple and Devil Plant. If that’s what it is, rest assured that it’s used extensively for growing eggplants by the migrant community in Australia and also in Asia. Not sure what other members of this family that are unsuitable for grafting are also called Devil Plants, I don’t know of any. I’d be curious to know who suggested that idea. So, if my stock is devil pant which I am confident it is , then most likley the fruit from the eggplant will be safe to eat . Thankyou once again. I have a large kerosene plant (Solanaceae mauritianum) that I am planning to graft with tomato and eggplant. I believe this plant is toxic to humans and is considered a pest in Australia. My question is, does the fruit produced via the grafts take on any of the rootstock toxicity. Is the produce safe to eat? Any assistance would be appreciated. 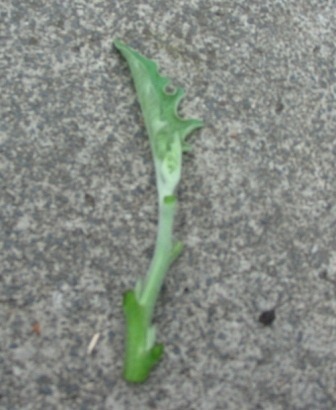 Solanum mauritianum (Wild tobacco) is commonly used for grafting eggplants here in Melbourne. The plant contains toxic alkaloids that render it inedible, but so do tomato plants, you can only eat the fruit on tomato plants! The produce is definitely safe to eat, the alkaloids do not transfer into the fruit. Thank you for your information. This weekend is grafting time!! Ruth I notice the cockroach berry bushes around here are flowering at the moment. The local council has been clearing a lot of roadside vegetation of late so they can be difficult to find. I will watch a couple of plants in a secret location of mine and let you know when the seed is ripe. Phil. Replying to one of your posts from 4 years ago, but same time of year. Can you let me know if you are still able to collect some cockroach berry bush seeds ? I’m after the capsicoides seeds. If you want to I can send you a stamped self addressed envelope. You can contact me on yves dot sedeyn at gmail dot com. I’m having a few problems with my grafted Eggplant onto Cockroach Berry. It has grown beautifully, nearly 2 metres high, flowers prolifically but no fruit. I have tried shaking and brushing the pollen between flowers but no result. It is growing in a glasshouse (not heated). Also heavy problems with whitefly & green aphids in the same area. I have vacuumed (low-pressure) the whitefly, sprayed with Eco-oil, hung yellow traps etc & squashed aphids with fingers & removed heavily infested leaves. Next plan is to use a horticultural spray – 1/2 cup dishwashing liquid, 2 cups veg oil – shake to milky colour then use 2 Tablespns of above to 1 litre water on a cool day. Bob this may sound weird but I have been having success with using a tuning fork! I bought one from eBay quite cheaply and found that by touching the flower stalks while it was vibrating the pollen was released in clouds and fruit eventually began to set. You can actually see the pollen drift as it occurs – works well on tomatoes, tamarilloes, in fact most of the members of the Solanaceae seem to need a “buzz” pollinator to set a decent crop. I have some plants of Solanum chrysotrichum growing close by.. this is the Giant Devil’s fig which can also be used as a rootstock. Seeds should be available in the next couple of months, there are a couple of people waiting for it on this forum. I was a horticulturist for many years here near New Orleans, Louisiana United States. Due to age and disabilities I can no longer work. However, my wife and I try to grow and raise our own food as much as possible. Soil borne diseases have decimated our garden the last years. These Devils plants seem like the perfect solution. If you would be so kind, I would love some seed for these plants!!! I have many vegetable seeds. If you would want some email me and I’ll send you a list of what I have to trade. Thanks in advance! I would also be willing to pay with money. Thanks Phil, the tuning fork is a bit left field but obviously does the job. I don’t have any problem with tomatoes in the glasshouse, just rattle the stakes that are connected by a long string. Does anyone have an opinion on Leopard Slugs. Ester Dean in her No Dig Gardening book extolled the virtue of them saying she had never seen one on a living plant. I have seen them on Rhubarb leaves and Eggplant but not necessarily eating but I did see one eating a Strawberry, admiiedly it was a bit overripe. As I only keep snails & slugs under control by picking them up & dropping into a bucket of hot water the Leopard slugs are becoming plentiful & I feel a bit guilty if I step on one in the dark. Are they good friends or enemies? Hi Bob, Leopard slugs are definitely beneficial, they are well know for being predatory slugs that eat other slugs and snails! I have removed and planted stem in corner of my garden hopefully i can graft on to it. I have heard of polinating pumpkin flowers when the bees were not around a few years back. Tuning fork idea could work for the musical good vibrations. I must stress the importance of safety here, an increased yield of eggplants is nice, but not that important that you would risk your health for it! Please use only tried and tested safe solanum species for eggplant rootstock, I can’t emphasise that enough. Great site – thanks. I heard of grafting onto devil plants on “Vasilli’s Garden” a few years back and have been trying to get one (on and off) since then. Recently I got one from Vasilli’s nursery (he normally sells them with grafts in spring but he said this year his grafts failed). It was a bit late in the season, and the plant was somewhat pot bound, a bit leggy and yellow and infested with white fly and two-spotted mite I think. I sprayed it, re-potted it and tried a couple of tomato grafts (I didn’t have any eggplants growing), one of which (using pretty much identical technique to what is suggested here) has taken, and the plant is looking significantly better. What I would like is some advice on what to do next. What sort of position/soil would it like to be planted in? I have an unheated green house but it doesn’t get as much sun as some parts of the garden, and the soil in it isn’t great, and tends to be very dry (due to an old pomegranate next door). Maybe I should keep it in a large pot so I can put it in the greenhouse when it gets cold? Should I trim back the tomato growth before winter so I can protect it better? Any suggestions welcome! Looks like I should take a cutting (the plant has one side shoot I can chop off) so I can experiment with some different possibilities also. I’ll be trying egg plant next season also, of course. I also wonder if Kangaroo Apple root stock would do ok in poor soil (like my front yard)…? ciao lee la cosa più bella della pianta diavolo la puoi fare crescere in terreni dove non crescerebbe quasi nulla non prende malattie alle radici come il pomodoro ho la melanzana per quanto riguarda l’inverno ti consiglio di ripararla per bene se supera l’inverno ti produrrà nuovamente puoi fare anche degli innesti di varie melanzane su diavolo cosi da avere un albero di macedonia hahaha ti consiglio molto sole per una produzione migliore e non togliere tutte le foglie del diavolo ma solo le gemme..
Hey guys I haven’t forgotten your seeds, we have had a bit of storm damage up here and I noticed some of the trees I was watching had a lot of branches snapped off. As they generally grow beside creeks they have been hard to get to with the high water levels but will check them out for fruit as soon as I can get access again. Thank you Phil, is good to know we have not been forgoten. I hope you have not been personaly affected by the stom, please take care when collectiong those seeds. Hey guys I finally managed to collect some fruit from the eggplant tree today. It is Solanum chrysotrichum, often called the Giant Devils fig. If you post your e-mail addresses on here I have plenty of seed to share. Phil. I would love some seed if you can spare some! Phil. here is my email: atimberline@yahoo.com …I also sent you an email. …much appreciate your work. …I have been collecting wild solanum here in the states and been doing some crossing and selection work… not a lot of the kind of success I was looking for but am finding some interesting genetic material and technique… a number of the attempted crosses have merely resulted in me finding ways to develope haploids/doubled haploids which immediately breed true. Also finding some parthenocarpic fruit set genetic make-ups. …so, not what I am looking for but, interesting, and may in future be of value to cold area and greenhouse growers. I would love some seed if you spare some. No probs – leave your e-mail address here and I’ll get back to you. Yay!!! I would LOVE some seed. My email is Nicole@farmcurious.com. Shoot me a note and I’ll send you my address. Thanks so much!!!!! Nicole I have sent you an e-mail, let me know where to send the seeds. Phil. Hi I too would love a couple of seeds. My email is sharonpkr20@gmail.com. When do I plant the seeds as we are in Autumn and I live in the south eastern suburbs of Melbourne. I have only just found this web site and would love to try grafting egg plant and tomatoes. I have been pinching the little tomato leaves that grow between the stem and main branch and hope I can keep them alive through the winter (I recycle empty toilet roll holders and fill them with potting mix – this works beautifully for all seedlings and I plant into the ground when they are quite big – no problem with snails eating my babies this way). Tomatoes are doing well and I am really hopeful. Got the seeds Phil. Man, what trip this is gonna be! Your idea of pollinating with a tuning fork was great! I’ve been using the vibrations from a battery-operated toothbrush with a piece of wire inserted (drilled & glued) into the very end of the hard plastic tip. Your idea is “no batteries required” and, will last forever. The article and replies have been enlightening. This thread seems to concern more folks with cooler/shorter growing seasons. Here, we have a rather long growing season but several mid-summer months of 33-34 degrees and above. My tomatoes and peppers pretty-much shut down production in these temps. By the time the season begins to change and cool off a little, my plants have usually caught one of the wilts, viruses or bacterial cruds and are either dead or close to dead. Do you know if growers were able to increase production in areas with extremely hot summers as a result of these grafts? Also, do grafts using “solanum chrysotrichum” work with hot peppers like the Bhut Jalokia, Habanero, Jalapeno etc….? Good to hear they have arrived ok. Theoretically I guess you could graft any of the solanums onto the rootstock, but I guess there are more experienced growers around than me. I read about a couple in the US who used Brugmansia as rootstock and grew poisoned tomatoes… but a lot of immigrants from the Mediterranean here use the Devil’s Fig without any ill effects. Glad you like the tuning fork tip – watch closely when you touch the stem close to the flowers, you’ll see the cloud of pollen burst from the anthers. Hi folks, I’ll repeat the warning, please DO NOT use just any solanum species as rootstock, as many are toxic. Use only the ones I have recommended in the article – they are tried and tested, and they have been chosen by cultures worldwide because they are the best rootstock for this purpose of grafting eggplants, these work the best, and are completely safe, which is why they are used! Great info! Have a lot of Devil plants at my place so will get myself some eggplant seedlings and graft them onto the little devils as soon as the seedlings are big enough. Wish me luck, I have never attempted grafting. Your photo is very obviously of a Giant Devil’s Fig (Solanum chrysotrichum, not S. capsicoides or S. aculeatissimum). Hi Gerg, your plant identification may indeed be correct, when people refer to “devil plants” for eggplant grafting, they may be referring (or indeed using) any of the “devil plants” in this family – Devil’s apple (Solanum capsicoides), Devil’s fig (Solanum torvum) or Giant devil’s fig (Solanum chrysotrichum). Here’s a link to a guide which shows the difference between Devil’s fig (Solanum torvum) and Giant devil’s fig (Solanum chrysotrichum) – see here. 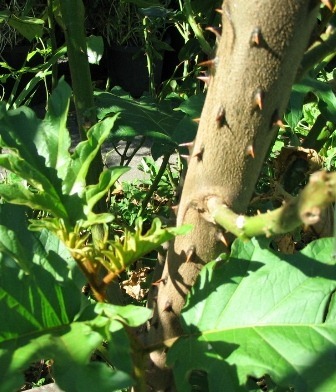 “Common name – Giant Devil’s Fig. Relationships – Michael Nee (NY) has made the comment on specimens in AD that the material of S. hispidum from Costa Rica and Panama is a complex of species of southern Central America and NW Panama, not fully resolved in Flora of Panama (see also Solanaceae Source for a discussion of this). They in fact recommend grafting eggplants on to a resistant rootstock to avoid the problem of bacterial wilt which is a major disease of eggplants. They are suggesting that Devil’s fig (Solanum torvum), Giant devil’s fig (Solanum chrysotrichum) and wild tobacco tree (Solanum mauritianum) are suitable as rootstocks for grating eggplants onto. Please note, I’ve edited the “weed” references in your comment as this is an international website and plants native to one or many parts of the world will be inevitably considered a “weed” (whatever that subjective term actually means) in some part of the world somewhere, that goes without saying. Since your concerns relate to Australia, it should be clear that the technique of grafting eggplants onto these rootstocks is used in the cooler states of Australia, where the main benefit is being able to produce a large crop over a relatively short summer period available for production. Also consider that in the cooler climates the rootstock does not grow so rampantly as it does in the warmer climates up north, and is not problematic. It would appear to me that the only valid reason why you would be grafting eggplants in the really hot climates where the rootstock may run rampant if uncontrolled is for disease resistance. It should go without saying that if a plant is problematic to a certain area, people should exercise some personal responsibility and common sense! Hello, have just come across all this great information while searching for grafting rootstocks for eggplant. Fantastic. I really want to get hold of some seeds if anyone has available!!! Hi Katherine, they’re grafting eggplants (aubergines) in many countries around the world, many people are doing it in Australia where I live too. Yes, you’re correct, my site is one of the few information resources world-wide on this topic! Remember, not everyone speaks English, has internet access or writes instructional material for free distribution! That includes most people world-wide who are living in self-sufficient communities or growing food for a living who use this technique! Yes you can grow it in a fairly large container, such as a 40-50cm wide pot so you can bring it inside, as log as it gets enough light it will be ok. I didn’t get a chance to graft any this year because we had another crazy series of ‘record weather events’ here in Melbourne, Australia. I’ll write about last years gardening adventures in detail in another article. Briefly, we had one of the coldest Novembers on record (our Spring season was really cold so summer vegies couldn’t grow and our warm season started a month or more later than usual), and then we had a record heatwave over a period of three weeks through February (our late summer) where the temperatures soared to around 40 degrees Celsius, without any rain, and now the temperatures have plummeted once again and rain has returned, so it’s anyone’s guess as to whether we will get more hot weather for summer vegetables to continue growing. Where I live, if the spring season, which is when I do the eggplant grafting, is not normal, then it ruins the possibility completely. A greenhouse would make a huge difference, but I don’t have one of those! Though my copy of Tomatoes for Everyone (Allen Gilbert, published 1997, reprinted 2006) shows a picture of a ‘solanum plant’ with both eggplant and tomatoes. At a guess I’d say its also Devil’s Fig though there is also mention (though not photographed) of the author grafting onto a weed ‘Solanum orvum’ (that’s possibly meant to be Solanum Torvum). So definitely not new. Your article is certainly the best instructional guide that I’ve seen on this particular topic though. Thanks for the links to extra information on the topic and your kind comments, much appreciated! After a bit of scouting around Melbourne I managed to get a Devil plant cutting a few weeks ago. I’m trying to get it established in water but after a bit over two weeks there is little sign of roots. Some white spots have formed on the lower stem (where submerged in water) about a week ago so not sure if that’s an early part of root development. Although the larger leaves died off, there seems to be some leaf growth. I am moving houses at the end of this week and wouldn’t be able to keep it in water for an hour or two that day so would it hurt to transfer it to potting mix sooner? Hopefully it works out because I may not get the chance to get another cutting after this. I’ve had some success in growing basil and tomato cuttings in water (although the tomato cuttings I started in potting mix seem to be doing better). Also any idea how these plants cope with frost? Where we’re moving to is 500-600m elevation, so a little more frost prone than Melbourne. I might be able to keep it indoors for the coming winter if that’s safer. To everyone posting about the ‘weed’ potential of the devil fig, please note THIS IS AN INTERNATIONAL WEBSITE (with 88% of readers from 121 countries outside Australia! ), and what plants may be indigenous or native to your area may be a ‘weed’ elsewhere. For some readers this is a discussion of their native plants. Your native plants are someone else’s ‘weeds’! A ‘weed’ is not a scientific or biological category or class of plant, it’s a value judgement statement based on human preference – it’s a plant growing where the observer doesn’t like it growing. If we were to write ‘weed warnings’ based on every geographical location’s perspective, EVERY PLANT WOULD HAVE A WEED WARNING! I agree with what you say. What I was saying with my last post is that it’s not a declared weed in (probably) most of Australia either. Where it is a declared weed (in a very small area of Australia) it may not be legal to grow now. It’s a shame that the authorities don’t consider the benefits of these plants as a rootstock when they declare it as a weed. That is why I suggest that taking care to not let this out into the wild so that it won’t be banned in other areas too. Indeed there are many other plants that people can legally grow purely for ornamental reasons that have the potential to become weeds too. Hopefully this website helps spread the word about the benefits of growing this plant. After all it’s much better for the environment than pouring lots of chemical fertilisers, etc. into the ground to compensate for a suboptimal rootstock. Hey, I would like to congratulate you on thigs blog =) I recently found it, while searching for information on Solanaceae grafting. In my region, there is no Devil Plant, but there are a couple of other species I´ve been thinking of using as rootstocks. This post was very enlightening, and I can see there’s a lot of other useful information here. Thanks for sharing the experience, anad good luck on the future work. A very kind man (Phil) from this site, sent me some seed for the rootstock. I planted them in a powerline area that was overgrown and unused for the 35 years that I’ve lived here. The cable/internet/phone company came through installing the new fiber-optic stuff and destroyed my all of my cherished rootstock! The area looked like ground-zero after they’d left! I had been out of action for a while due to a health issue and hadn’t grafted any plants yet. My Devil plants were nice and healthy and now they’re gone. Does anyone know where I might locate some more seed? I can certainly benefit from the extended growing season into cooler temps. But, will I experience better production when our tomatoes, eggplants and peppers normally shut down during our extremely hot summer months? I love this idea! I’m trying to find a way to create herb trees, with herbs grafted into a tree-like stem (trunk). Specifically, I’d like to grow spiicy or globe basil, in this way. Do you know what rootstock I should use? That’s a rather unusual thing to try to do! To be honest I don’t think it’s even possible, but if anyone has any ideas, I’m open to hearing about them! Out of all permaculture websites/blogs I consider yours to be the most informative and easily readible with clear instructions! thankyou. My parents grow eggplant each year (Melbourne) and when I came across this article I was gobsmacked! My father would definetly benifit from a devil plant and therefore wopuld like to ask where I can get one or seeds from? Do you know of anyone who has had success grafting capsicums onto devil plant rootstock? If so, is it the same procedure as for egg plant? I’ve never heard of capsicum being grafted onto a devil plant before, perhaps because it may not work, may be worth a try. io ho innestato peperoni, è moto difficile che attecchiscano e se pende la crescita non va come quella delle melanzane! crescita bloccata non sono molto compatibili. sto provando su piante di rocoto ben sviluppate dovrebbero essere più compatibili. Do you think I can use Solanum macranthum/ Solanum wrightii as rootstock for eggplant or tomato? Will the fruits be poisonous? non penso che sia tossico come il mauritanium è comunque i cinesi innestano melenzane su piante di mauritanium, ho lasciato l’indirizzo dove ho dato molte spiegazioni su come innestare le melanzane, c’è anche il video dei cinesi che innestano le mellanzane. Could you repost the address for information and the Chinese video please? http://www.forumdiagraria.org/orticoltura-f42/solanum-chrysotrichum-l-albero-delle-melanzane-e-non-solo-t77645.html ciao sarei interessato a semi di australasica lemon o varietà diverse di solanacee se qualcuno mi puo aiutare ne sarei grato. in questo post ci sono divesi video di impianti cinesi di melenzane innestate. ok giovnanni pensavo avessi dei semi, ho trovato su ebay usa il solanum macranthum voglio provarlo. comunque io sconsiglio di innestare su piante altamente tossiche, il chrysotrichum è eccellente per lo sviluppo delle melanzane la varietà piu bella da innestare è senza dubbio la violetta lunga seta molto produttiva e diventa un vero albero di melanzane. For Australian Solonaceae, try the site below. They deliver world wide. I still can’t find the Chinese video. I see many photos but no video. https://www.youtube.com/watch?v=dnKmumFmSLQ grazie per il sito di semi. Mr Macrello: yes, if I do try to grow its better to play safe, use the ‘safer solanum rootstocks. What I like is the big2 plant of the Solanum macranthum. One plant will give all the fruits I want, right? gianni non so dirti se i risultati ottenuti innestando su Solanum macranthum siano identici al chrysotrichum per i frutti dipende la qualità di melanzane che si innesta le innaffiature devono essere poche in fase di fioritura e continue quando ci sono i frutti, per farli ingrossare cosi facendo le melanzane vengono senza semi. l’impianto deve essere in pieno sole per crescere e dare ottimi risultati. Thankyou very much for the link to the Chinese grafting video Marcello. Thanks a lot Mr. Marcello. You have been very helpful on this subject for us. grazie signor giovanni. ho ordinato i semi di solanum macranthum dagli u.s.a appena arrivano farò crescere subito dei semi, cosi in primavera avrò una pianta da innestare. comunque penso che sia identico al chrysotrichum come caratteristiche ma solo innestandogli si scoprirà l’effettivo potenziale . Mr Marcello; It will be good when you have grafted and get it to fruit. I hope you would post and share with us your results for reading your postings! Thanks in anticipation. certamente! il mio post è in continua evoluzione. pubblico sempre foto nuove. se qualcuno vuole contribuire nel post con la propria esperienza, e il benvenuto . I have Solanum Torvum commonly called Devil’s Fig, Pea Eggplant or Turkey Berry seeds for sale all year round. Better stock than others in my humble opinion as it is 100% edible and just as hardy as the more toxic Solanum, AND it’s not a declared or noxious weed in any state of Australia. FREE postage on all seed orders anywhere in OZ. Worldwide shipping available. I absolutely encourage offers of swapping/trade/barter too, and would much rather add something cool to my collection, than just make a couple bucks. Hit me up, make an offer, don’t be shy! Hey phil@tyalgum, My e-mail address is joseph19042@gmail.com. Please, can someone give me e-mail address of phil@tyalgum if possible? Shipping of Solanum Torvum seed is NOT available to the USA , never has been, but yeah I agree that they are mistaken in their information. I meant “Worldwide shipping” in general. There are a few things I won’t send to a few places, and it normally says in the checkout and the advert, and if the person still insists on buying despite me asking not to, I just refund or send a similar permitted species. This fella does not regrow from the fiberous roots if the tap root is pulled, it is totally edible so the bugs and critters keep it in check in the bush, and the spines are nowhere near as bad as the other Solanum mentioned above. Mistakes with ID are pretty common with every countries quarantine and the lists are constantly changing, so if you plan on importing anything, particularly seeds or plants, it is always best to check with your local state AND federal quarantine departments, BEFORE buying anything overseas. As the “importer” it is also your legal obligation, so I hope you all do that before every international purchase, from every vendor. You would be surprised by some of the dumb stuff that is prohibited for import in some countries and states. Australia’s laws are some of the most baffling of all. Please note, this is an article on grafting eggplants onto a more vigorous solanum rootstock, not a weed debate – I’ll write an article on weeds soon and welcome on-topic comments there! I’ve omitted any off topic comments here as I like to keep each article’s comments relevant for readers. In case anyone is wondering why the term ‘weed’ is unscientific, it’s simply because it’s a human value judgement that refers to any plant growing successfully where people don’t want it to, and is not a valid scientific description of any group of plants botanically, and does not help us understand the plant from a scientific perspective. il chrysotrichum per infestare una zona, ha di bisogno di un ambiente umido è caldo! abitat ideale canali di scolo rive dei fiumi. è molto piu infestante il Ricinus communis L. resistente anche a lunghi periodi di siccità. To whoever is able to help: I have grafted a devil plant stock to the eggplant six months ago, and it has grown well and is producing fruit. However I have noticed that suddenly the leaves have started to shrink and some are quite dry, and are falling. I’m not sure why this has happened, and I was wondering if anyone would be able to give advice about what has happened and how it can be fixed. What season of the year are you in? I’d say it’s the sudden cold overnight temperatures we’ve been experiencing this late in spring. Eggplants, like tomatoes, originate from warm climates and require warm overnight temperatures to grow well. Low overnight temperatures below 8 degree Celsius (46.4 degree Fahrenheit) can harm the plants. ciao in base alla mia esperienza, questo succede quando c’è carenza idrica o il problema è Tetranychus urticae controlla sotto le foglie con una lente. I recently purchased a grafted eggplant from Bunnings in Melbourne. I have never seen this type of graft. They left the original eggplant as is and grew a strong rootstock next to it. They then chopped off the top of the rootstock and got one of the original leaves ( Stem ) and forced it into the rootstock. So the rootstock is feeding the original eggplant via a leaf stem. Interesting concept. It’s just the start of summer in Melbourne, Dec 26 and the planting is growing very well and has set about 6 eggplants already. Ready to harvest the first one in about a week i’d say. Hi Lucas, they are commonly sold, it’s just an approach graft of one eggplant rootstock onto another, so two identical roots feed one plant. You can also buy tomatoes that have been approach grafted, but in this case they are always grafted onto a cherry tomato rootstock which is stronger and more vigorous than the root of a regular sized tomato. Is there a possibility of a photo of the approach graft? I have been trying this in WA and have just had some minor success. Not a great union so far but better than any of my other attempts. At this point I am happy that I have a callous on at least one side of the grafts. The idea of just a leaf as a graft seems good to me. Hi everyone. I found someone on ebay who is in Tasmania/Australia and they are selling Kangaroo Apple 15 seeds for $5 delivered. I have ordered some as I think the plants will cope well with the cooler climate here in Melbourne. I read they are native to the southern areas of Australia. I want to try grafting tomatoes, eggplants & capsicum onto them. I successfully grafted an eggplant to a Kangaroo Apple root stock this summer, so yes it is possible. You can find Kangaroo Apple growing natively around Melbourne it will grow from cutting and you can collect seed at this time of year. So no need to pay $5. Keep in mind that although native it is a potentially invasive colonising plant when introduced to new areas. The only problem with kangaroo apples is that they are only short-lived shrubs that last between 4-6 years, otherwise it’s a great choice. It is a fast growing plant that actually does produce edible fruit of its own, but they must be thoroughly ripe to eat because the unripe fruit is poisonous. An Australian government website says ‘Only eaten when outer skin bursts in summer, mealy, slightly acid taste’. Personally I’d be quite happy to get 4-6 years out of a an Eggplant/Aubergine plant. In the mean time you could make new cuttings off the rootstock and graft new offshoot as scions. If you did that every year or even every second year I think you’d have a pretty good crop renewal in place. The reason Kangaroo Apple plants die off is because they tend split at the base and they die off from rot/fungal infection. I’ve observed this on wild specimens that were in poor health/dying. So by taking cuttings you essentially creating a new plant that will live another 4-6 years. Perhaps this could even be bred out in the long term with selective propagation. I suspect there may even be some larger ones in the wild that are much older than 4-6 years and these ones may have better genetics than others. Hi Jeza & Angelo. Thanks for your responses. Angelo which rootstock do you suggest for a plant that will last longer than 5 years? Jeza I guess you don’t live anywhere near Sunshine hehe. Which part of Melbourne have you found the Kangaroo apple? Which technique did you use for grafting. I’m pretty bad at grafting but I’m just starting and hoping for the day when the scion takes. I have a rocoto chilli that I’m using at the moment to experiment with grafting. I found this video on youtube I know its 40 minutes but its got so much info about grafting. Have a look. Thanks so much Marcello… wonderful!!! Thanks Marcello for providing us with a very inspirational video. That guy has great vision. I’m starting my rootstocks ( Rocotto chilli & Kangaroo apple ) indoors 5 months before spring. Let’s see how I go. It can be difficult to obtain seeds for the wild tobacco so I will just make do with what I have for now. ciao lucas, non so se hai visto le discussioni precedenti, ho lasciato l’indirizzo del forum dove ho pubblicato molti innesti di melanzane. a breve metterò nuove foto di innesti su alti potrainnesti anche quelli di peperone su rocoto. where can I get a sample of this Solanum mauritianum, or tree tobacco? …been looking everywhere… and no birds are dropping seed anywhere within a thousand miles of this place, that I know of. I will be happy to send up to 20$ to the ones who can get me some viable seed in the next month or so. …want it for some rootstock comparison trials. …send viable seed and I will send $ to you. This is legitimate research. Thanks. …good to contact me first. ciao atimberline, prima dovresti vedere se nel tuo paese è concesso entrare semi di piante invasive. io posso fornirti semi di chrysotrichum e fra qualche settimana mi dovrebbero regalare quelli di mauritianum. Hi atimberline. I wouldn’t wait for a source of Solanum mauritianum to come about. It will come if you keep looking. In the meantime I’d use chilli rocoto as a rootstock as I think it’s freely available in the USA. Thanks Lucas, yes, it is available here. ciao lucas, se vuole innestare melanzane su rocoto non ha senso, io lo sto usando per il peperone, per vedere la resistenza al freddo anche se in sicilia il clima in inverno e mite. io consiglio il chrisotrychum o il macranthum ho comprato i semi in florida. I am doing lot of experiments on grafting. Sureshkumar, are you living in Australia? Do you have seed or plant (Devils Apple) I need a root stock for my eggplant grafting. Also see previous comments with reference to Qld Dept of Agriculture article describing the use of this and two other solanum plants as a grafting rootstock in a primary production setting, this plant is a valuable agricultural resource! This was posted after it was declared in the Government GAZETTE 28TH February 2014 as a Noxious Weed class 3 in the Far North Coast County of NSW. I would love to be able to post current photos of it for everyone to see why. The growth of Solanum in this area is out of control. Hi David, Do you have seeds of Solanum Capsicoides (Devils apple). And do you stay in Australia? I need it for a rootstock for my eggplants. I’ve enjoyed reading this article and the comments. I’m in South Florida, and I managed to get seeds for Turkey Berry (Solanum torvum), and I’ve got several growing and had success using an eggplant similar to Black Beauty, called Florida Market. I used the veneer graft technique. I’ve had several failed attempts with the Rosa Bianca eggplant, so there may be a compatibility issue there. I would love to hear what other varieties people have had success with. I want to try an Asian variety called Ping Tung next but need to buy the seeds. Depends where you are in the world! I am in Melbourne and was wondering where I can get some devil plant. I have about 5 eggplants trying to grow and now know why they still look like they are for Barbie and Ken! Do you happen to know if Solanum Glasnevin is a viable rootstock? I am here in NZ and most of the Solanums mentioned above are not allowed here. Solanum crispum ‘Glasnevin’ is also known as potato vine or Chilean nightshade is an ornamental vine and is unsuitable for grafting edibles onto. Solanum aviculare, called Poroporo in New Zealand and Kangaroo Apple in Australia will work as a rootstock for grafting eggplants, you shouldn’t have any trouble finding this in NZ, as it’s a native plant. Thank you for the reply Angelo. Got my Poroporo seeds now and will start planting. Another question, is there an ideal height/age for the rootstock? Like do we have to wait until the Solanum rootstock be at least half a meter tall? Have you also tried doing it when both scion and rootstock are still seedlings? When both rootstock and scion are about the thickness of a pencil or thicker is a good time to graft. I would NOT, under any circumstances, graft eggplants to any random unidentified member of the Solanaceae family of plants. I have mentioned the safe Solanaceae family plants to graft to, please stick to those only! As an international free information resource, we only provide information to the world, not seeds! Am trying your technique with tomatoes grafted onto kangaroo apple (tube stock). 4 weeks in, so far so good!!! All three grafts have taken and are growing strongly! Am excited to see how they will progress! Hi Rob, that sounds great, hope the grafts work well. Please let us know how it goes. Thanks! I have successfully grafted to Kangaroo Apple. Though unfortunately it died over the winter from frost. I tried to protect it with a PET bottle though either it was too late or not enough. I’m hoping to grow some eggplants in the greenhouse over winter this year which should give me a lot more cuttings/scions to utilise in the spring. Obviously you’re more likely to get a successful graft that takes, the more you do. has anyone ever grafted on solanum linnaeanum (apple of sodom)? Qualcuno di voi ha mai innestato sul solanum linnaeanum o mela di sodoma? I have some Devil plant (also known as Giant Devils Fig) seedlings growing in Melbourne (Aus). I accidentally propagated a few too many, which probably isn’t a bad thing as it gives me more root stock to experiment with. Though if I have any to spare is there anyone around (in Melbourne) who is a responsible gardener (care must be taken so not to let these plants get out into the wild) and wants one of these plants? The other possibility is that I can propagate some more from seed or cutting. Hi Jeza, I’d love to get a cutting or seeds of your Devil plant. I’m in Melbourne & keen to graft with responsibility. My email is lucch@hotmail.com. Thank you. Hi jezza, I’m from melbourne and am looking for some seeds/cuttings or little plants to have a go at some responsible grafting and growing 🙂 would you have any still I could have? Hi Isabelle. I have left a message about the giant devil fig but I didn’t hear anything back. I can offer you a cutting of a Kangaroo apple. I’ve never used it myself but I heard its a good rootstock. I’m in Melbourne’s west. Hi everyone in Sydney & Tony. If you would like seeds or a cutting for Solanum mauritianum ( wild tobacco ) there are about 100 growing wildly in Leppington. To find them you will have to go to Leppington Co-Op Camden Valley Way, Leppington. When you face the front of the store Camden is towards your right and Liverpool towards your left. Walk about 100m to your left on the side of the rd. You will pass a house with about 2 acres. You will then find a bulldozed area, walkin about 50m and you will see them growing wildly there. There is a creek there as well. I didn’t have any problems cutting the seeds off with scissors but others have said this plant can cause irritation, so perhaps bring gloves etc. I’m not sure how much more they have bulldozed but I’m sure they didn’t bulldoze the creek so should be some area still. Good luck. Can anyone send me some solanum mauritianum seeds please? I am farmer from India how can I get some devil plant seed from you . ciao joseph, non trovo questi maledetti semi di mauritianum hai qualche seme? Credo che Shankar honmane si sia confuso del fatto che io abbia semi, ma io li sto pure cercando. Scusa non avevo letto che li stavi cercando, i semi di mauritianum sono difficili da trovare almeno qui in italia, ho contattato anche toni cordello per i semi ma non l’ho piu sentito. quest’anno faro nuovi innesti multipli. Me l’avevi scritto sul forum anche a me non aveva risposto. Joseph, Io ho semi di chrysotrichum ma se vivi in australia non credo che posso spedirli, alla dogana non entrerebbero perche ritenuta specie invasiva.nel territorio australiano. Hi Joseph I am looking fo the devil plant seeds, I live in Sydney, could you post me a few seeds, thanks Joseph. Hi tony gallo, for now I haven’t any seeds of solanum chrysotrichum. In the spring it will bloom and so I will send some seeds. But for now I’m searching for solanum mauritianum seeds. Has anyone got photos of grafted egg plants after winter? Mine have survived on a covered verandah (Busselton, Western Ausrealia) quite well. No frosts or temperatures below 1 degree C over winter. I will send photos later. I am getting close to planting them out in the garden. I have a devil plant in the ground which I will graft onto soon. ciao Andrew Weinert, il peperone non riuscirà a sviluppare come la melanzana rimarrà rachitico. thank you Marcello, you are correct, all the capsicums have died 😦 at least I have tried ! I am very interested in experimenting with grafting onto Solanum capsicoides. Can you recommend a reputable seed source? Sorry, I am also looking. I have a friend who is trying to help me, but so far, no success. I’m not sure how reputable this seller is as I’ve never purchased any seeds from Etsy. At this point it’s either obscure eBay, Amazon or Etsy vendors for seeds. I can’t seem to find them from any vendors I recognize. ciao, ho a disposizione semi di solanum chrysotrichum, semi di Solanum linnaeanum, in piu appena fruttifica il solanum macranthum. il problema è se i semi spediti passano la dogana del tuo paese? I am in the US. I am not seeing any mentions of those plants being prohibited but I am rather unfamiliar with these breeds so I may be wrong. I am definitely interested in seeds if you’re willing to send some to me. The Solanum capsicoides seeds on eBay at the moment are from a seller I have bought from before, his seeds always have a high germination rate and are true to type. Is this the seller you’re referencing? The listing you mentioned isn’t showing up on my side. My assumption is that they do not ship to the US. Has anyone order seeds from lupinaster on eBay? I’m not sure why I’m not seeing it on my side. Can you post the link? Thank you so very much for sharing this information! I found your website some weeks ago now and must admit reading it has become my favourite pastime! My poor mother must be getting sick of me ringing her with exciting updates to share from it all the time. I have been gardening since I gained the hand-eye coordination needed to pull weeds, studied Botany at university, and now read gardening books and magazines every night (spot the geek! ), and I am amazed at the variety and freshness of the ideas you share on your blog. Many of them have been new to me and I am excited to try them. Thank you so much for making the time to share your wisdom with us. I imagine it can get very frustrating, especially after reading those comments above which were repetitive and demanding, so just want to make sure you know how much your work is appreciated. From other comments it appears that you are building a community, which you deserve to be very proud of. I look forward to growing my own eggplant tree with Poroporo and incorporating many of your ideas into my new back yard garden (ca. 6m2 so nothing fancy!) First up will be your stunning berry arch, which is COMPLETELY drool worthy. Anyway, just a little positive energy coming back your way. I get you think you are helping people and are just a nice guy but, just be careful offering to send seeds of Giant Devils Fig (Solanum Chrysotrichum) to anyone. It is a class 3 Declared Noxious Weed in our area and under that legislation sharing seeds is an offence. The wording says “it is an offence to knowingly distribute”. The reason is this plant was a sleeper weed for the last 35 years and now it is at the stage I don’t think we will get it under control. If people start growing it in other places around Australia it may acclimatise there and do the same thing. Hi Kim for NSW, so you’re from Far North Coast Weeds. You’re on an international website, and as I’ve stated before, it is every person’s responsibility to act responsibly and comply with their local regulations. Guessing Phil’s from your way! My question is “knowingly distribute” where? To China for example? Is that an issue? That would be a pretty screwed up regulation if the recipient location was okay with it! Yes Phil lives in our County district. I spoke to DPI in regard to your “mail it to China” scenario. They create the legislation around Noxious Weeds and we are the control authority. They agree knowingly distribute would be worse if you are introducing it into new areas. In reality distributing it here where it is endemic would be of little consequence as the birds and bats are doing that already. So just because it is not declared a pest weed in another area is merely an indication that it is not there yet. The potential to become a pest with some Solanum spp can never be underestimated. 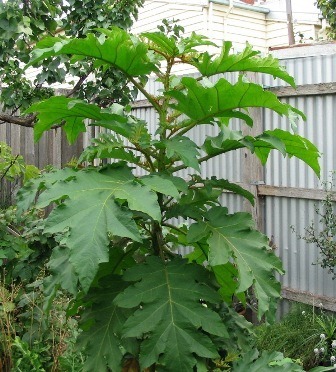 DPI do a risk assessment on weeds so you would have to ask the recipient location how they felt about introducing Giant Devils Fig based on what has happened here….I would not wish this on another area and if we are smart about it we would not take the risk. Kim can you check the status of S capsicoides for me. ABC’s GardeningA Australia has been promoting it as the preferred rootstock – another species which grows wild around here. I will be visiting Melbourne in the week commencing 24th October. Can you suggest any gardens to visit where grafted eggplants are working? I would like to visit other productive gardens that are open to the public. I am familiar with Ceres, but that is from 20 years ago. Excellent article, great explanation and pics. I too live in Melbourne, Australia and are looking Forward to trying this out. Apparently the devil plant is a local weed! Hi Phil, the only trick to this in Melbourne is getting the grafts done early enough in case we have a short summer, and covering the plants in winter so the grafts don’t die off. The devil plant may somewhat be ‘weedy’ if ungrafted and abandoned, but no, it’s not considered a weed in Melbourne. The climate is too cool down here for them to be a problem. (Solanum laciniatum or S. aviculare ) after a discussion with one of my Gardening buddies. We collected 3 specimens form a local area, potted them up giving them a few weeks to ” get going” and I will attempt to graft with an eggplant. I have had a relatively poor tomato season and have read that grafting tomato plants into kangaroo apple root stock works really well. Since I have retired I am able to spend a lot more time in the garden – it’s been great! Hi Phil. From everything that I’ve seen of tomato & eggplant grafting, the scion takes best on an established rootstock ( 1 year old plus ). I did try grafting onto a very young kangaroo apple rootstock but it failed. I think the older the rootstock is, the stronger it is, and its more able to accept a scion. However I’m always one to experiment so please let us know if it works. PS has anyone tried grafting onto a tamarillo? I tried it with a tomato on a young plant but the scion didn’t take. Thanks. Hi phil. I agree with Lucas the kangaroo apple rootstock have to be 1 year old to hard and established.I have grafted eggplant and cherry tomato into kangaroo apple rootstock and also into wild tobacco, both are doing very well, I thing 2 years old kangaroo apple rootstock very good option. Hi Sargon. That’s great to hear your grafts worked on a Kangaroo apple and wild tobacco. Is there anyway I can see some pics of them? I’ve got a 2 year old wild tobacco that I’ve grafted a tomato onto and should have some ripe tomatoes in March. The wild tobacco is a vicious plant and mine got out of control after 6 months, but I guess that’s what makes is such a good rootstock. Just right down your email address and I will send many photo. Hi Munir. Its lucch@hotmail.com. Please use the subject line as grafting so I can see it as I get heaps of junk mail. Many thanks. Are there any photos of tomatoes grafted onto devil plants? Ciao ragazzi, Per chi è interessato quest’anno ho svernato delle piante di melanzana innestate,quindi puo vedere le foto http://www.forumdiagraria.org/orticoltura-f42/solanum-chrysotrichum-l-albero-delle-melanzane-e-non-solo-t77645-1150.html le piante il secondo anno diventano molto piu grandi e produttive, ho trovato i semi di solanum mauritianum che innesterò appena diventano abbastanza grandi. Andrew Weinert: la mia e-mail (marcy179@virgilio.it) puoi inviarmi le foto grazie. Angelo I like the revamped site, it’s such a popular and important thread. As you know I have all these wild solanums growing on the roadsides up here, pleased you detailed the weed risk and the differentation of the species. Thanks Phil, glad you like the updates I’ve made! From a permaculture perspective all those wild solanums growing on the roadsides are free resources available for use. The permaculture solution thinking perspective is that if people were uprooting all the devil plants and wild tobacco plants growing where the authorities don’t want them and using them for grafting eggplants and tomatoes, or even using them for commercial scale agricultural plantings like they do in China, we would solve two problems at zero cost! Wouldn’t that be nice! What plants have successfully been grafted to these devils? Is there a limit of scions I should attach to the host plant? I guess I want to know how far I can push a rootstock before it’s too much for it to handle. I’ve seen videos of marijuana growers using grafting techniques to have multiple strains on a single mother plant. I guess this way they save a bit of space and make more accessible clone banks. Could you do this with for example a host rose bush as a way to produce different coloured flowers on the same plant by adding other rose varieties? This stuff just blows my mind. I’ve already got my devil plant seeds/cuttings after a quick walk down to the local park this morning and can’t wait to experiment with it. Thanks for sharing all this great info! Hi Alex, the grafting potential of devil plants is huge, they have a really strong root system and are very vigorous. You can keep grafting till you run out of branches and they won’t care the least. As mentioned in the article, in China they take advantage of grafting for commercial production to get maximum yields. Eggplants are most often grafted onto devil plants though tomatoes also work, probably not as well though. It’s quite normal for heritage apple fanciers to have many varieties grafted onto a single tree, you’ve just got to make sure that the more vigorous varieties grafted onto the tree do not outgrow and shade out the less vigorous varieties that you graft to the tree, otherwise you’ll lose the graft. I’ve grafted different roses onto a rose bush, the grafts take quite easily actually! I am not sure how far you can “push it”, but different strains may be more or less virulent. If one graft strain is stronger, it is likely to take over the root stock over time….look at the fruit salad citrus bush. If you are not diligent with the pruning, one scion graft will take over- usually the lemon. I suspect the eggplants would likely be similar… though i have not tried it. Eggplant grafts aren’t a problem at all in terms of pushing the limits, but I agree that those multi-graft ‘fruit salad’ citrus trees with 5 grafts are a complete disaster, the most vigorous grafts take over, the weaker ones die completely and you end up with one variety, two if you’re lucky. For citrus and many other trees, a better solution is backyard orchard culture, see the linked article I wrote, you can plant many trees kept small using summer pruning in the space of one large tree, or you can use many-to-one-hole plantings to create one tree with multiple separate trunks and root systems which form a single canopy! These are egg plant and tomato grafts on a devil Plant. I was surprised how easily the tomato’s grafted. They were much better than the egg plants!! Grafting is really a productive method of gardening. I have heard the first time about Devil Plant. Although I am familiar with Devil Plants. I am new in this grafting and i try to find the devil plant for a few months with nothing. So would please (or someone) help me to have some or buy some of the devil plant seeds Or the plant. I don’t have any seeds, so can’t help you. There may be other people with similar solenaceous plants. In Western Australia they grow well in both. They grow far better in the ground, but it will grow in a pot, which will really restrict its size and capacity to produce. I noticed S. capsicoides seeds for sale locally on eBay again. Hi Chris, I bought some from ebay. they grow but not the same as the Devil’s apple tree. The seeds that I got from ebay become a kinda bushy and thorny plant(not anything close to the original Devil’s apple tree). I was scared about the poisonous nature of some plants hence did not go further from there. A friend gave me a real plant and I have just started to graft, 2 of the seven have taken off. Great article, thanks. We have a wonderful eggplant tree which has been prolific this year. Question: is it necessary to cut prune / cut it right back to it’s base once at the end of the growing season, or can i just wrap it up and protect it in its current size over winter? thanks! If you can protect the grafted tree by covering it and the grafts survive over winter, that is the ideal situation! great, thanks! I’ll give it a go…. Ciao ragazzi, questo è il mio video innesto melanzane su mauritianum. I am experimenting with various chilli varieties being grafted onto Solanum Torvum. I think I have at least one that has taken as I am seeing new shoots on the scion and believe there is healing occuring at the graft point. If over the next week or so it continues down this path, I will start to introduce outside before claiming victory. All I can say is those damn thorns on the Solanum Torvum are brutal! Please let us know how well the chilli grafts work! To solve the problem of the large thorns, I just cut off the tips of the thorns with secateurs, once cut they stay blunt and don’t grow back. Out of interest, do you know what the longest living Solanum plant I can get seeds for in Australia is? Wild Tobacco looks to last for 30 years, but don’t think I can get the seeds easily because of the weed status. I think it is your best explaining of grafting eggplant on adevil plant.It is very informative. I am trying to get or to buy some eggplant graft rootstock Or seeds for nearly two years and still not have any. Please help me if anyone have. My email is xwang@mtvt.com.au. It works quite easily, just protect them from heat and wind.